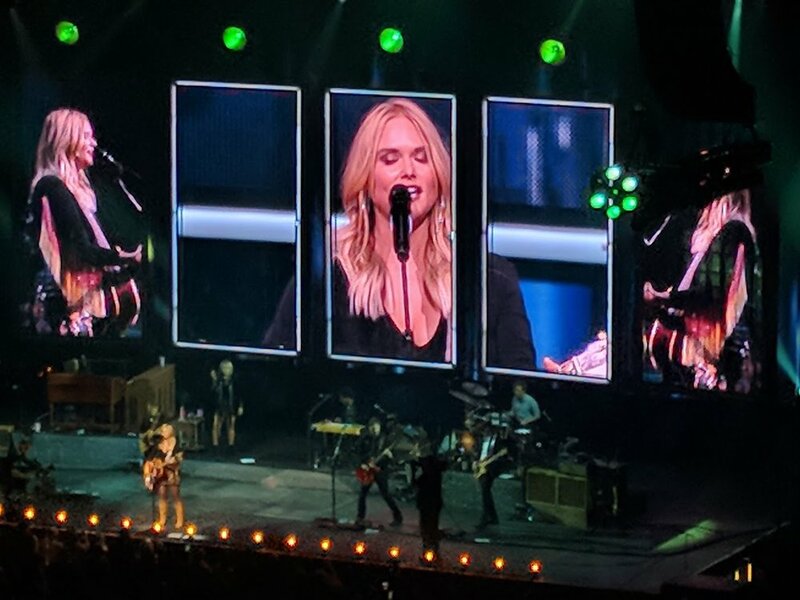 Miranda Lambert is one of my favorite musicians, but I've not seen her perform live since 2011, because every time she comes to California, we have a conflict. When I found out that she was scheduled to perform at The Citizen's Bank Arena in Ontario, CA, I was ready to purchase tickets. I held back because it's winter and we live in a ski resort town. I just knew that if I bought tickets, that we'd get a snow storm and not be able to make it down the mountain. Just a few weeks before the concert, I bought a plane ticket to join Dan on his business trip to Portland. 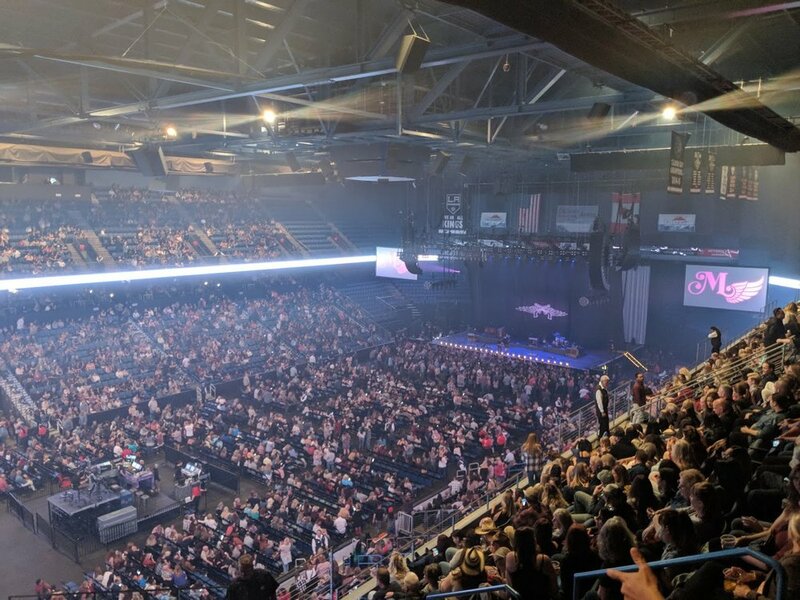 The return flight home landed just hours before Lambert's concert and the concert venue is a five minute drive from the airport. I wasn't willing to risk snow, but I could risk a delayed or canceled flight. Luckily, we had zero problems. 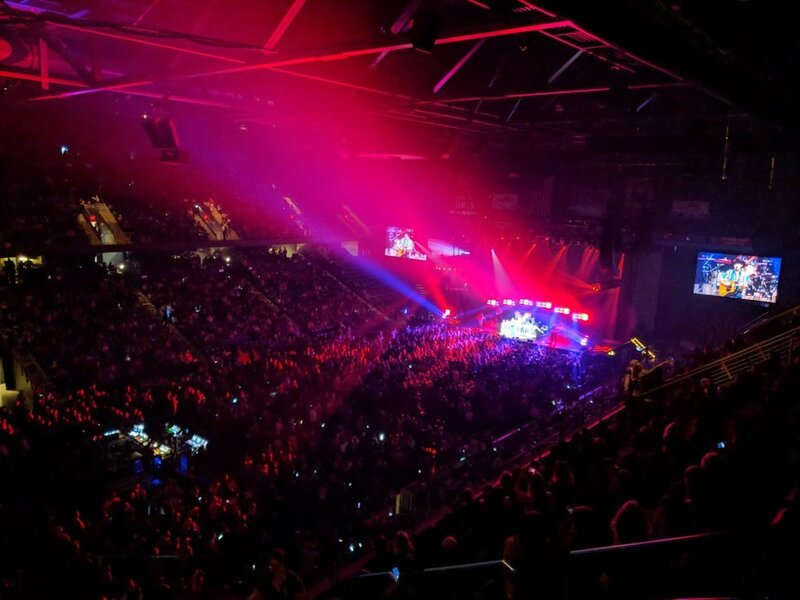 I always like to make sure that we see the opening acts ( a great way to discover new music and just to be supportive of the artists. Plus, I don't like to disturb the people sitting near me), but we couldn't get inside in time to see the first opener, British singer-songwriter Lucie Silvas. We technically arrived on time, but the queue for security was enormous. I'm not complaining, because I'd rather that they take security seriously, but it's definitely something that takes longer at concert venues nowadays. Arrive early and be patient! Silvas came back onstage to sing an Aretha Franklin cover "Do Right Woman, Do Right Man" with Lambert. We made it to our seats in time to catch a majority of John Pardi's set. I didn't think that I was familiar with Pardi, but I recognized several of his songs from country radio, such as "Head Over Boots." As you can see from the above picture, our seats were far back. We were in the last row, but because they were closer to center, we had a great view. The concert was sold out and when I went to purchase tickets, I only had a choice of a few seats through Ticketmaster resale. I've seen Lambert perform eight times and these were the worsts seats/ most expensive tickets. Her popularity has certainly grown. This was Dan's first Lambert concert and he was really hoping that she'd do her cover of Gillian Welch's "Dry Town." She didn't, but he still enjoyed her concert. A video showing Lambert's road crew played as they were setting up for her to take stage. It was a fun tribute to all of the people ( so many people) who work hard on her tour. It was also very cool to see songwriter, Gwen Sebastian singing background vocals on Lambert's tour. 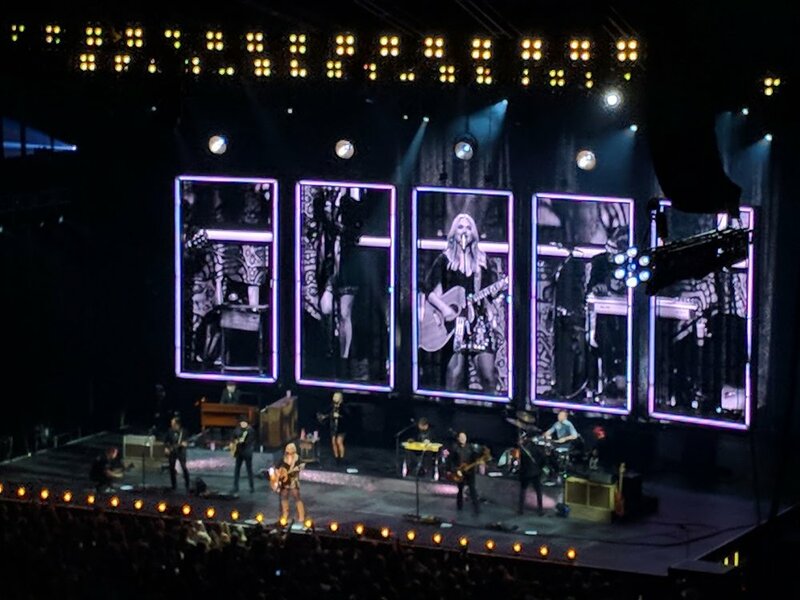 Lambert started the show with her energetic cover of John Prine's "That's the Way the World Goes 'Round." 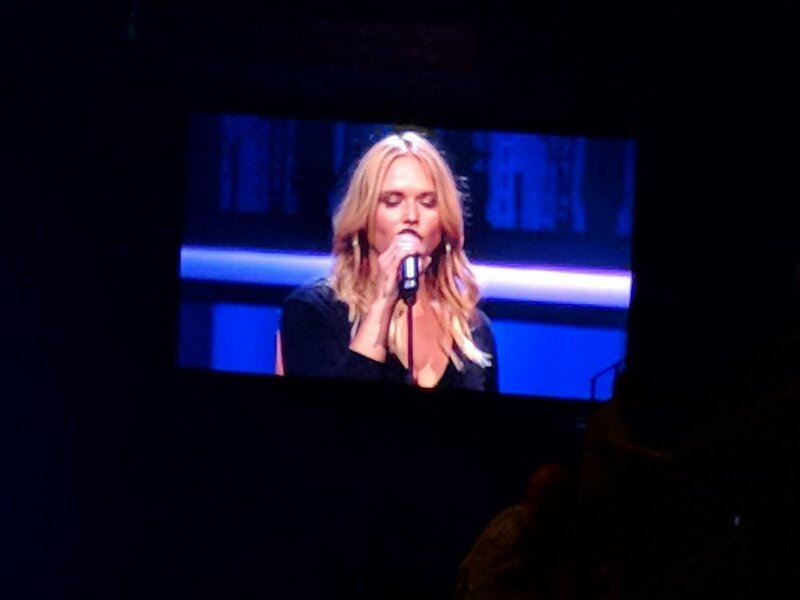 Lambert played songs spanning her career, including her latest album, The Weight of These Wings. When I saw her in 2011, she debuted a few songs that she had been working on for her 2014 album, Platinum, but most of the songs off of that album and her latest, I had not heard performed live. I was thrilled to hear her perform "Tin Man", "Vice", and "Bathroom Sink." She donned a pair of pink sunglasses for her sassy song, "Pink Sunglasses" and gave them to a child in the audience. 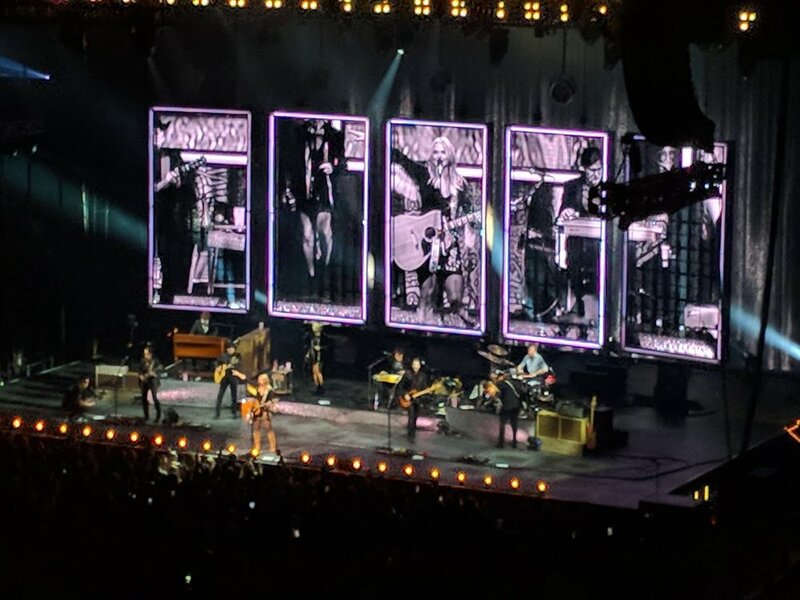 Lambert's encore was "Little Red Wagon," in which she changed a lyric to reflect that she no longer lives in her ex-husband, Blake Shelton's home state of Oklahoma. Lambert mentioned in the concert that she likes to put on a show that gives you all of the feels. When she performed "Over You," I started thinking of my mom and the tears flowed. Not that I enjoy being emotional in public, but there is something about the energy of a live show that is cathartic. Lambert likes to use the phrase "Music is Medicine," and if there is one artist that this is true of for me, it's Lambert. Her music has helped me through plenty of rough times. I'm so happy that we were able to see Lambert's latest tour. It was a great evening out and money well spent. Here is a picture as we were leaving the arena. One more thing that needs to be mentioned: Lambert had the coolest outfit. She was wearing a long-sleeve top with a plunging neckline and incredible fringe on the sleeves, a floral embellished leather mini skirt, and cowboy boots. She rocked it! I love pageantry and crazy sets, but there is something to be said for an artist that comes out and just performs a long set, without changing outfits. Ten years ago, Jenny Lewis and the Watson Twins (Chandra and Leigh), collaborated on one of my all-time favorite albums, Rabbit Fur Coat. Music has a way of marking the important events, eras, and changes in our lives. I remember listening to Rabbit Fur Coat on my first generation Ipod, while working on schedules in the attractions office at Universal Studios. I was still in the Back to the Future building, listening to Jenny, but the BTTF theme music was invading her vocals. My first marriage was starting to crumble, I had an awesome apartment in Pasadena, and I didn't yet know that my mom had cancer. In fact, today, February 4th, marks the eighth anniversary of my mom's death. It's hard to believe how much my life has changed in ten years. Last Friday night, Dan and I headed to the Cathedral Sanctuary at Immanuel Presbyterian Church in Hollywood for the Rabbit Fur Coat 10th Anniversary Concert. This was my first time attending a concert in a church. At first, I was surprised that the venue allowed Jenny Lewis to play here. Have they listened to her lyrics? A church was a surprising, unusual, and delightful venue choice. Also delightful, was the program. I've never received a program at a concert, but the theatre lover in me, was all kinds of excited. Cool touch Lewis! I like surprises, but even more, I like to know what to expect. It makes it easier to plan those bathroom breaks. I'm guessing that people are expected to go pee before coming to church, because the bathroom situation was lacking. Two stalls for women + sold-out enormous church = a patience test. Luckily everyone was so excited to see Jenny, that the chatter kept the line happy. It seemed like everyone else in line had traveled from another state for the show. The enthusiasm was unparalleled. The seating was general admission, so with the exception of pews that were roped off for VIP's, it was a free-for-all to find a good spot. Dan noticed that the balcony was open, so we rushed up stairs. Here was our view. The view was good, but the sound was just okay. This is not an ideal concert venue. It's beautiful though. I love the chandeliers. M. Ward, who produced Rabbit Fur Coat, was the opener. I'm not familiar with his music and since the sound was wonky, it was hard to hear most of the lyrics. The venue worked best with quiet, soft songs. Speaking of soft, Jenny Lewis and the Watson Twins kicked off the Rabbit Fur Coat album with an acapella version of Run Devil Run, sung from the back entrance of the church as they walked up the aisle to the stage. They ended the album by exiting the same way, while singing the reprise of Happy. It couldn't have been a better use of the venue to bookend the songs on the album. They did Rabbit Fur Coat in its entirety, with one brief costume change before Lewis sang the title song, alone on stage. M Ward joined in on their cover of The Traveling Wilbury's Handle with Care. The energy in the audience was positively electric. After the intermission, Lewis continued playing for another hour with a set filled with songs from her solo albums. She played hits like Silver Lining, See Fernando, and Just One of the Guys. She threw in a new, unreleased song, which made the audience go wild. Jenny Lewis has a very loyal and vocal fan base. After nearly every song, several people in the audience would shout out "I love you Jenny" above the applause. At one point, an excited fan managed to get on stage and have a brief conversation, before security hauled her off. Lewis handled it like a pro and was kind to the fan, making everyone love her even more. My favorite moment of the show came in the second act, when Lewis climbed up on a box and sang The Voyager, the title track from her most recent album. Lewis has the most pure and beautiful voice. I could listen to her sing anything, but then she goes and writes these insanely perfect lyrics. I'm just in awe of her talent. And hey, as a kid, I totally obsessed over The Wizard and Troop Beverly Hills. I know, apples to oranges, but I've been a long time fan of all things Jenny Lewis! Last Tuesday night, I headed to Hollywood with my friend Julie, to see my favorite musician/songwriter, Josh Ritter, perform with The Royal City Band. This was my fifth time seeing Josh Ritter perform live and he never disappoints. What I love most, is how he uses concerts to play different variations of his songs. The entire vibe of a song changes dramatically when slowed down, sped up, or played with different instruments. Ritter always surprises during his concerts, including this one, where he played a new, never recorded song. This concert tour is in support of his latest album, Sermon on the Rocks, which was recorded last year in New Orleans. He played a majority of the new album, but also pepper the set with many favorites, like Girl in the War and Good Man. His encore included two of my all time favorite songs, The Temptation of Adam and To the Dogs or Whoever. As with his previous shows, Ritter performed with an enthusiasm and joy that is simply infectious. The opening band was a folk band called Elephant Revival from Colorado. They had a woman playing a washboard, and another playing the fiddle. Good times! Admittedly some of their songs were a bit artsy and experimental for my taste, but others that leaned towards rock and singer-songwriter, appealed to me. The lead male singer has a wonderful, rich voice. Normally, The Fonda Theatre is one of my favorite concert venues. It's small enough to feel intimate, not a bad view in the house. It's stylish ( if not a bit unusual in its art work) and the sound is excellent. This was my first time that I had a negative experience at The Fonda Theatre. We had tickets for seats in the balcony, which are first come/first serve. Arriving early, we secured great seats, not that any spot in the balcony would have provided a bad view. The problem was the security working the balcony. One of the guards that was stationed to patrol the front of the balcony had his radio turned up high. Many songs in Ritter's set were quiet, and the guard's radio kept going off, interrupting the performance. Although concert goers in the balcony complained and shot him dirty looks, he did nothing about the noise level on his radio. He was also intrusive when it came to people sitting in the reserved section at the front of the balcony. Instead of waiting between songs to check their tickets, he would loudly barrel over and communicate with them mid-song, no matter how quiet the nature of the song. It was incredibly distracting and rude. Never once was his noise a necessity or something that couldn't have waited to take place between songs. What I admire most about Ritter, is how within the economy of a song, he is able to tell a complete story with vibrant characters and unusual phrasing. His writing is emotional, honest, and surprising. Frustrating security guard aside, I left the concert feeling energized and inspired to get back to writing my novel. Trivia- Julie, who is German, told me that Ritter means "Knight" in German!